We met at my house for IGS V yesterday and managed to get in a few games. I’m always amazed at how many games you don’t get to play when you put your mind to it. Given the amount of time we had I expected to play at least four if not five heavier games but for some reason or another…we just played slowly. In any case, I had a good time and managed to play a couple of my unplayed games. 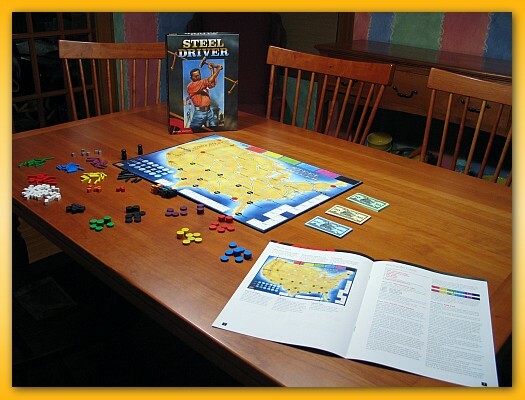 We had a new attendee, Tom, a friend of mine from several groups around the neighborhood bringing our group size to six so we dove into Steel Driver by Martin Wallace. Steel Driver is an interesting train-themed game where players bid cubes for a share in the company and control of individual trains for the round. The number of cubes winning the bid also determine what resources you have to build track in a later phase of the game. Where you build your track is important since the end game involves grabbing goods cubes from individual cities you’ve connected to and the number of sets of unique cubes drives the value of individual shares amassed during the game. Next up was Citadels by Bruno Faidutti. New to me, the game pits players in a race to pay and lay eight cards. In a Mission: Red Planet type of mechanic, players pass a deck of role cards around the table, each taking a role granting them a special ability. 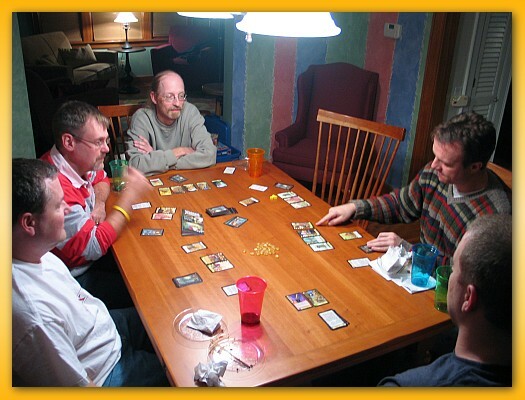 Players gather gold, kill other characters for the round, steal gold, become king, swap cards, adjust turn order, etc. in the race to play the valuable eight cards. Watch out though, the Warlord role can pay to destroy some of your cards! Citadels is a fun, back-stabbing romp. La Citta is a neat game of city building but watch out. You’ve got to pay close attention to how close you build to other cities because you’ve got to contend with people moving between cities depending on what services are unveiled as important for the round. You must grow the population of your city to gain victory points but you must also build farms to feed your growing population. You’ve also got to build the appropriate city features to sustain population growth and reduction. There’s a lot going on in this game; it’s going to make a quick rise on my top 10 list of games. Now, if I can only get it to the table a few more times in short order. Thanks everybody for coming. I always have a great time playing games with friends and just wish I could host them more often. Thanks Martin. That was very kind of you and I greatly appreciate your generosity. I joined the BGG Chit Chat forum’s Blatantly Obviously Barney (B.O.B.) Super Semi-Secret Santa Exchange a few weeks ago. After signing up, you get assigned a target and you purchase something for them and send it to them. Since we all kind of know a bit about each other from spending so much time around each other in the forums, you get a pretty good idea about what to get someone. A gift arrived today and I can only assume it’s from my B.O.B. Santa. And…and I’m flabbergasted. It’s awesome. It’s stupendous. 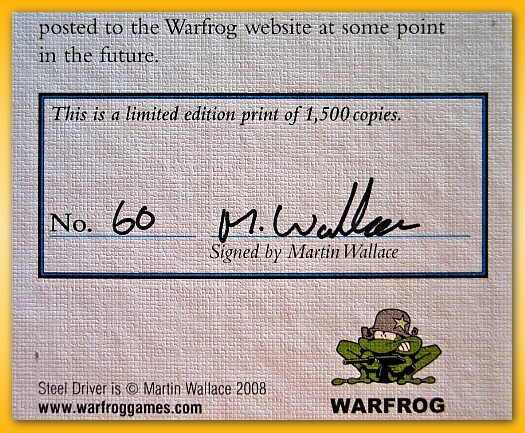 It’s a signed, in-shrink, copy of a Martin Wallace game called Steel Driver. It’s print number 60 out of the 1500 small print run. Steel Driver is a train-ish building game for 3-6 players lasting about an hour. Although it’s supposed to be blatantly obvious who the Santa was, I’m without a clue. However, the timing could not have been more perfect. I’ve got a big game day/night scheduled soon and it would fit right into the group. Noah joined Lisa and I for a three-player game of Hacienda tonight. I eked out a 3 point win over Lisa. It was a rather non-interactive game where we played, for the most part, as solitaire players. However, there were a few opportunities for blocking that, thank goodness, they didn’t take since I was able to link two independent land tile groups into a massive group at the end of the board allowing me to lay down water tiles with abandon. I thought Lisa had me though since she dominated the middle connecting to seven markets granting her a lot of points at the end of the game. I really like the game and look forward to playing in an upcoming impromptu game fest. Lisa and I played a two-player game of Hacienda tonight and although it was looking good for me through 99% of the game…she jumped ahead at the end when she placed an awesome water blob (seen on the left edge of the image above). I ended up with too much money at the end and no chance to convert that into victory points by buying an additional Hacienda in the next to last round. Arrrrrrg….I’ll get you next time! 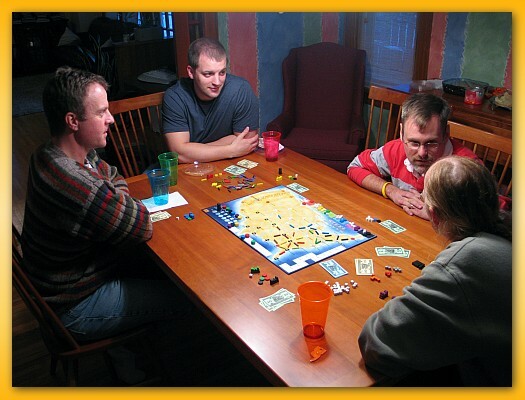 Cambria, designed by Eric Vogel and published by Vainglorious Games, is an area control & dice rolling game for 3-5 players lasting 20-30 minutes. Players represent Hibernian warriors attacking the thinly protected Roman fortresses and roads near the end of the Roman occupation of Britannia. Players take turns rolling dice and placing cubes or the Legion pawn onto the roads that lead to the fortresses. When a fortress is completely encircled by cubes, the player with the clear majority of cubes becomes the winner of the victory point token on the fortress. Some fortresses award points to the clear second place majority holder (if one exists). If no clear second place majority holder exists, the points are not awarded. Unlike games like Samurai which awards tokens as soon as a city is encircled, Cambria only awards victory points when a single clear majority holder exists. If a tie exists for first place, the fortress and its victory points remain contested. Cambria relies on the outcome of rolling two dice for the placement of cubes. On their turn, players roll the dice and are allowed to place a single cube on an unoccupied road that leads to a fortress represented by either of the dice. For example, if the roll was a three and a five, the player could place a cube onto a road that leads to a fortress designated with a three [b]or[/b] to a fortress designated with a five. If doubles are rolled, the player is allowed to place a cube on an unoccupied or occupied road (allows for the removal a rival player or the Legion pawn). Fortresses are worth from two to six victory points so, as you might expect, rolling a one has special meaning. A roll with a single one and any non-one (e.g. a one and a six) grants the player the option of placing a cube normally (using the six) or placing the Legion pawn on the road represented by the non-one die (i.e. the six) The Legion pawn is allowed to kick off rival players when placed and places a block on awarding points since a fortress can only be awarded when it is encircled completely by cubes. If double ones are rolled, then the player must move the Legion pawn. Any time the Legion pawn is moved by a player, that player has the option of placing a cube onto one of the unoccupied ships to the west of the land mass. The cube remains on the ship and can be used on subsequent turns to modify the value of your roll. Immediately after rolling the dice, at the start of your turn, you may choose to modify one of the die using any single cube you have placed on a ship in a previous turn. For example, if you’ve rolled a three and a five and you have a cube on the three ship, you may remove the cube from the three ship, and convert the five to a three. After the optional conversion, your turn progresses normally with the new values on the die. You are free to remove a cube from a ship without modifying the roll (for purposes of placing the cube on a road). 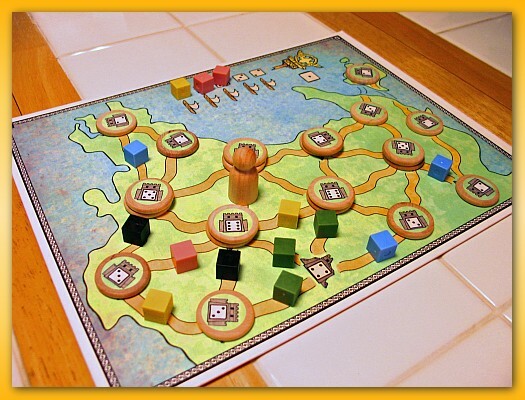 When six or fewer fortresses remain on the board, the game ends and final scoring takes place by evaluating all remaining fortresses for a clear majority awarding points as if each fortress was completely encircled. The cubes are plastic. The Legion pawn is wooden as are the victory point tokens affixed with stickers showing their point values. The board is a small, non-folding, rectangle of chipboard affixed with the map. The dice are smaller than I expected but functional. The box is oversized and very thin and showed a fair amount of top down crushing/deflection. You would not want to stack anything on top of this game. The artwork is relatively austere (shades of light green), but functional. 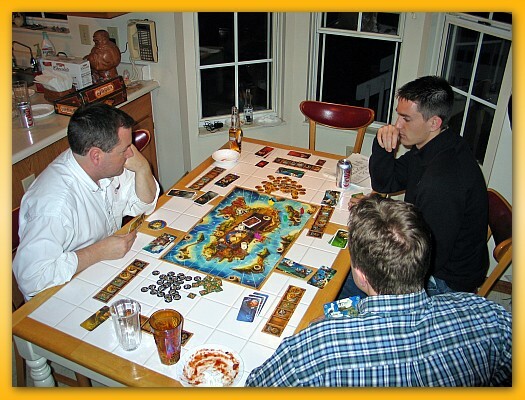 I’ve played Cambria numerous times covering all numbers in the allowed player range and I’ve played the game with adults in my gaming group and with my kids. I must say that the game is fun. The randomness of the dice is mitigated to some degree by using cubes on the ships. In the end, you are at the mercy of the dice so the game is not heavy. The play time is short making it perfect for a lunch-time game at work. Given a smaller box and maybe even a foldable board, one could reduce the size of the game dramatically. The game does exhibit a fair amount of “take that” by allowing players to knock other players off juicy spots on roads and by dumping the Legion pawn in a hotly contested area. I’m not fond of the end game grab of incomplete fortresses as this can cause a wild swing at the end of the game. With three players the board feels wide open but not overly so. It takes more of your own cubes to encircle the higher numbered fortresses which means you’ll be less involved in the lower valued areas. I’ve played games that flowed very quickly and were over in 10-15 minutes and I’ve played knock down, drag out, games that have taken 30-40 minutes to play. With four players, the contention for cities is higher but both games I played with this number were very short. I’m unsure if that was due to the luck of the dice or a knee in the curve somewhere. With five players, fortresses were highly contested, and there was a lot of blocking going on with the Legion pawn. However, there were a few rounds where people passed having no place of interest to place a cube. I can only surmise that five is just slightly too many players although I did still have fun. I do wish that there were some ways to mix up the layout of the map in some way to keep the game interesting. Fixed map games like Hacienda enjoy a large following of home-grown maps that keep the game interesting and I wish that there could be some way to spice the game up a bit after multiple plays. I also wish that there was a two-player variant of the game although I suspect that that would require some form of ghost third player like Alhambra. 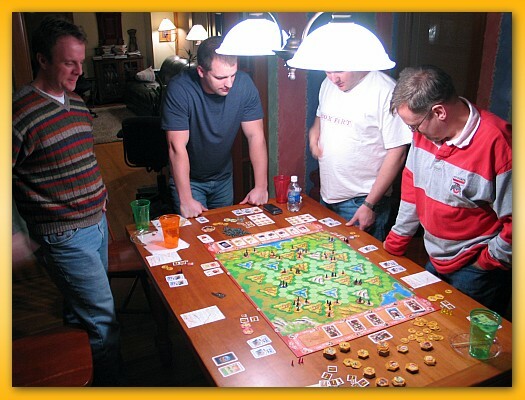 I’ve rated Cambria a 7/10 mostly due to its simplicity of play, size, short time length. It’s not a “brain burner” but it really does fit well as an opener/closer for your game nights or for an after lunch game while at work. 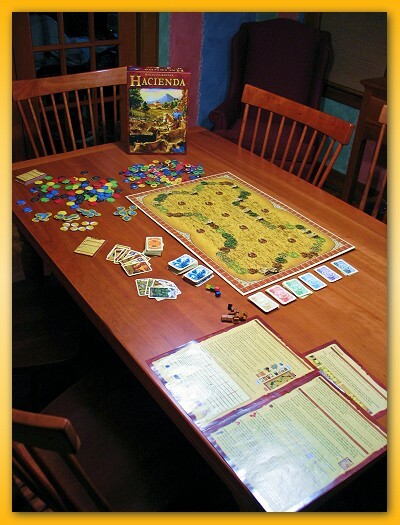 My BGG trade for Hacienda arrived today and I read through the rules while looking at the bits. I traded away my copy of Amyitis…good riddance. Hacienda plays 2-5 players (supposedly best with 4) but supposedly good at all player counts. 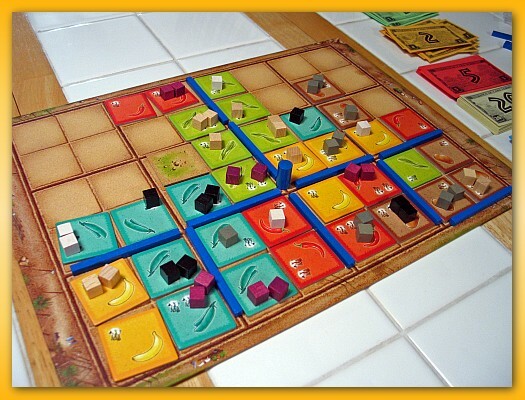 Hacienda is a relatively simple to understand tile laying game. 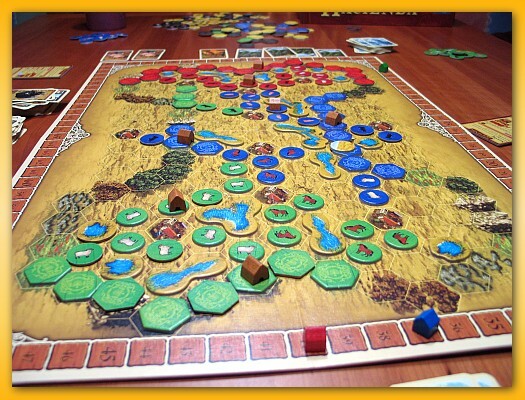 Players vie for placing land tiles (top left) along the bone-shaped perimeter of the board, placing animal tokens (top center) or watering holes in the yellow-ish areas of the board. 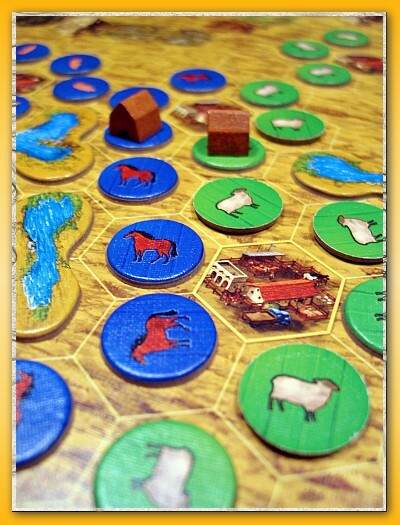 In two scoring rounds, players score their herds of animals and land tiles in how they’ve been placed relative to fixed markets, watering holes, etc. In reading the rules, the ever growing herds of animals can flow in an almost Through the Desert-like caravan in attempts to reach watering holes and markets. However, there are no area encirclement rules and there is an economic addition with money being used to purchase land and animal cards. In another interesting twist, the board is two-sided providing the bone-shaped symmetric layout of land tiles and the flip-side providing a asymmetric layout. Looks like neat stuff and looking forward to playing with Lisa and/or the kids. First up on the agenda was a five player game of Cambria. I’d played with all other numbers of players and really needed to get in a five player game before I started writing my review. The game was highly cut throat and very defensive lasting a bit longer than I was accustomed. Still fun but the small map does make it pretty tight with five. More on that in my upcoming review. Next up was Jamaica. Nobody had played but me and with five, it also drug a bit. I ended up making a mad dash to Port Royal leaving everybody else behind the positive point line but one player at +2. Good family game but not as deep as what I normally like on game night. The artwork still rules. Last up was Santiago. I’d never played with five and I must say it was fun but boy was it important who was in control of placing the water. Nice game and looking to more plays. Jared was a new player to our group. He’d played a game of Cambria with us over lunch and I hope he enjoyed the other games we played. I was glad to have another player on an otherwise lightly attended night.